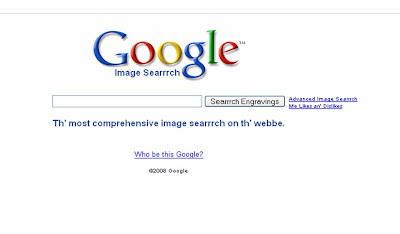 Google Pirate theme for International Talk Like A Pirate Day and Friendfeed go pirate too! For 'International Talk Like A Pirate Day' Google have a pirate theme, Friendfeed have a Friendfeed pirate logo and Reddit have introduced Pirate speak across their site! I wrote this morning about how Facebook have introduced English (Pirate) as a language setting for Facebook today (which changes your Facebook profile to a pirate theme) and it seems Google, Friendfeed and Reddit are also joining in with 'International Talk Like A Pirate Day'! 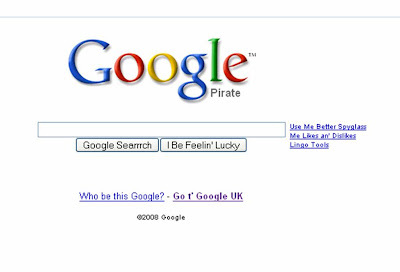 Google have created a pirate themed Google browser for International Talk Like A Pirate Day. The buttons have all been given a pirate makeover, offering 'Google Searrrch', 'I Be Feelin' Lucky' and 'Who be this Google?'. Sign in has become 'Me Account' and signout has become 'Catch th' outgoing tide'! The International Talk Like A Pirate Day changes to Facebook, Google and Friendfeed raise a smile and are a nice distraction from all the bad news in the world at the moment. Huh! pirate day has a map not like this,I will check back.